1.1. How does the chemical environment differ between the inside of a cell and the outside? Most substances are present at different concentrations inside and outside the cell. Potassium ions are much more concentrated inside the cell, sodium ions are much more concentrated outside the cell, and so on. Over the long term, these differences are maintained by energy-consuming pumps, conceptually similar to the pumps that compensate for air leaks from pressurized aircraft. 1.2. Do the chemical differences balance out electrically, or is there an electrical potential difference between the inside and outside of the cell? The net effect of the various ion imbalances is typically to leave the inside of the cell about 90 millivolts (mv) negative with respect to the outside. Patterned changes in this transmembrane voltage are the basis for the unique properties of nerve and muscle cells. 1.3. What is an ion channel? The cell membrane is bridged by pores, each of which at any given time is either open or closed, and each of which, when open, allows specific ions (sodium, potassium, calcium, or chloride) to move into (or out of) the cell. These pores are called ion channels. Ion channels are voltage-gated, meaning that other things being equal, a channel will be open when, and only when, the transmembrane voltage is within a specific range. There are a few dozen sorts of channels, varying with respect to which ions they pass, the voltage range at which they are open, their speed of opening and closing, and their sensitivity to other factors (temperature, pH, ion concentrations, and so on). The charges carried by ions moving through channels cause the transmembrane voltage to change, so opening a channel begins a process that will inevitably lead to the closing of the channel. Along the way, the changing transmembrane voltage may trigger the opening or closing of other channels as well. 1.4. How might an ion channel malfunction? Channels sometimes fail to open when they should, and sometimes they fail to close when they should. 2.1. What is an action potential? The upward change in transmembrane voltage (from -90 mv to +20 mv) is called depolarization, while the downward change back towards -90 mv is called repolarization. 2.2. Why don't the depolarizing channels re-open as soon as the repolarizing flux has moved the transmembrane potential back into the range in which the depolarizing channels are normally open? After closing, a channel is for a certain time incapable of reopening. 2.3. Why does one action potential follow another? In some cells (including most cells of the heart), there is no true resting potential. After an action potential, the voltage level of the inside of the cell does not rest at -90 mv. Instead, it gradually rises, leading to the voltage-triggered opening of the depolarizing channels and the beginning of another action potential. The capacity for this sort of spontaneous depolarization (and therefore spontaneous initiation of action potentials) is known as automaticity. In cells demonstrating automaticity, the rate of spontaneous depolarization is to an extent characteristic of the particular cell, but external factors (temperature, pH, and so on) can affect the rate within certain limits. 2.4. How can malfunctioning ion channels affect the action potential? 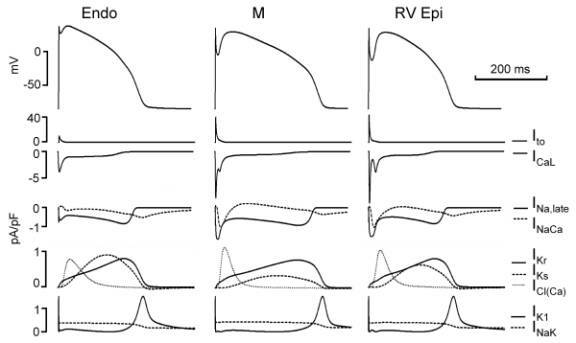 If depolarizing channels fail to open, or if repolarizing channels fail to close appropriately, then development of an action potential can be prevented from occurring at all. 2.5. Do all cardiac cells have the same mix of ion channels, and thus the same sort of action potentials? shows the relation between the action potential in three different (simulated) canine ventricular myocytes, with parallel displays of the currents through the most important of the contributing ion channels, where Ito is the transient outward K+ current; ICaL is the L-type Ca++ current; INa is the sodium current (the early sodium current is not seen in the figure because its initial peak is so much larger than any of the other peaks shown [typical peak of 200 pA/pF]); INaCa is the Na+ / Ca++ exchange current; IKr is the rapid delayed-rectifier K+ current; IKs is the slow delayed-rectifier K+ current; ICl(Ca) is a transient outward Cl- current, activated by intracellular Ca++; IK1 is the inward rectifier K+ current; and INaK is the sodium-potassium exchange (the “sodium pump”). The action potentials differ in shape and duration from cell type to cell type, and this is because of the differences in channel activity. The paper provides a fuller explanation. 3.1. How can one cell's electrical activity affect the electrical activity of another cell? Some adjacent cells are directly coupled, so that ion flows in either cell lead to more-or-less immediate changes in the transmembrane potential of the other. Even where these specialized connections are not present, adjacent cells' transmembrane potentials tend to approach each other through capacitative and other forms of electrical coupling. In particular, the occurrence of an action potential in one cell is likely to trigger action potentials in adjacent cells. 4.1. How do the action potentials of the various cardiac cells combine to produce a normal heartbeat? Of all the cells in the heart, those of the sinoatrial node (the S-A node) normally have the most rapid rate of spontaneous depolarization. Action potentials in the sinoatrial node trigger action potentials in the atrial muscle cells and in bands of specially-connected cells leading to the atrioventricular node (the A-V node). The action potentials triggered there are propagated in turn through the conduction system that includes the specially-connected Bundle of His, right and left bundle branches, and Purkinje fibers. Finally, the action potentials in the Purkinje fibers trigger action potentials in the ventricular muscle cells. In the atrial and ventricular muscle cells, the electrical action potential is associated with a mechanical cycle of contraction and relaxation. Throughout this process, even though all of the cardiac cells mentioned are capable of spontaneous depolarization, spontaneous depolarization does not proceed to the point of triggering action potentials in cells other than those of the S-A node. This is because spontaneous depolarization in these other cells is so slow that the chain of action potentials started in the S-A node for each normal beat gets to each of the other cells before that other cell has got around to triggering its own action potential. 4.2. What can go wrong with this process? The cells of the S-A node can sustain a decrease in their rate of spontaneous depolarization, or even lose their automaticity altogether. The heart will then be dependent upon impulses generated by other cells, and the resulting heart rate may be so slow as to be dysfunctional. Similarly, the A-V node or conduction system can fail, so that some or all of the impulses started in the S-A node are lost, leaving the heart beyond this point dependent upon spontaneous depolarization of slower pacemakers. One or more cells elsewhere in the heart can develop rates of spontaneous depolarization faster than those of the S-A node, so that these cells trigger action potentials in themselves and in adjacent cells, independent of the S-A node. The resulting cardiac activity (a triggered arrhythmia) may be merely less organized and less efficient than the normal one, or it may (especially if it is very rapid) be totally ineffective. In various ways, most simply by development of an island of electrically inert and nonconductive tissue surrounded by normal cells, the heart can acquire a loop of tissue around which a chain of action potentials can trigger itself indefinitely, with – in the worst case – each cell triggered by the previous one as soon as its depolarizing channels could possibly reopen. The triggering action potentials need not be full-scale action potentials; early afterdepolarizations may be sufficient. Cells adjacent to the loop can be triggered too, and the resulting cardiac activity (a reentrant arrhythmia) is often dysfunctional.